On Sunday, September 4, in Learning Life’s second live, international, family-to-family dialogue, personal introductions quickly led to latin dance introductions. 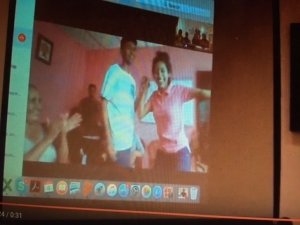 In this first meeting between two American families and four Salvadoran families, all family participants were asked to introduce themselves not only with their names and occupations, and in the case of the children, their age and school grade, but with something interesting about themselves they wished to share with their foreign interlocutors. Eduardo, a tall, soft-spoken, fourteen-year old Salvadoran boy was the first to speak. “Me gusta jugar el fútbol y bailar” (“I like to play soccer and to dance”), he said. “Que tipo de baile?” (“What kind of dance?”) asked Paul, the American dialogue moderator. “Bachata” — a type of latin dance which originated in the Dominican Republic — Eduardo responded. “Puedes mostrarnos?” (“Can you show us?”) asked Paul with a smile. Eduardo smiled in return. 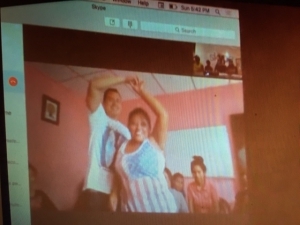 Literally less than a minute later the dozen or so assembled Salvadoran parents and children moved their seats to form a dance floor, selected and started playing music, identified Eduardo’s dancing partner — Delmi, a seventeen-year old girl from another of the Salvadoran families — and off they were both, smiling and dancing bachata in an office in El Puerto de la Libertad, El Salvador, before their American audience 3,200 miles away (by car) in Washington D.C. This proved to be the first of three Salvadoran introductions that led to dance demonstrations — of a Salvadoran folk dance, and “reggaetón,” a music and dance of Puerto Rican origin that blends reggae, hip hop, and latin influences. The Americans, shy in the moment, nonetheless promised video demonstrations of their own passions — ballet in thirteen-year old Elyse’s case, and basketball in eleven-year old Kaniya’s case. The American and Salvadoran families went on to discuss serious topics, including the problems their communities face. The Salvadorans reported problems with the privatization of water, and criminal gangs that threaten legal businesses and innocent bystanders. The Americans noted problems with youth gangs in school and police mistreatment of African Americans. 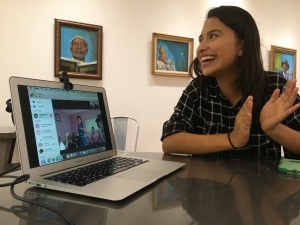 This second live, international dialogue — organized by Learning Life in partnership with CRIPDES, a grassroots organization working to empower Salvadorans in some 300 rural communities across El Salvador — followed the first dialogue between two American families in Washington D.C. and a Senegalese family in Dakar, the capital of Senegal. These dialogues are central to Learning Life’s Citizen Diplomacy Initiative, which works to nurture family and youth development through international dialogue and collaboration. 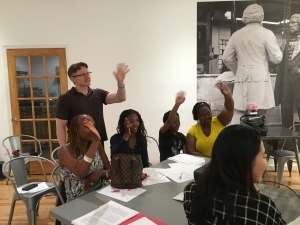 Through November 2016, Learning Life staff and volunteers plan to organize a series of pilot dialogues between families in Washington D.C., Puerto de la Libertad, El Salvador, Dakar, Senegal. Stay tuned for more! We would like to thank CRIPDES and Learning Life volunteers Karen Tituana and Derrick Costa for their help in making this second dialogue possible. Thanks also to the nonprofit UNIFI for allowing us to use their cafe, Artdrenaline, in Washington D.C.’s Anacostia neighborhood, to conduct this live dialogue.